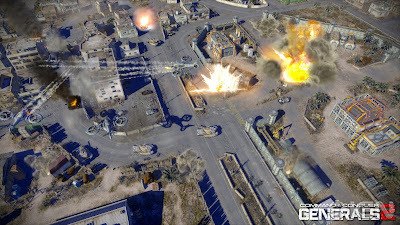 First details of upcoming Command & Conquer: Generals sequel come from an interview by IGN. The interviewed persons were Bioware co-founder Dr. Ray Mazyka and Bioware executive producer Jon Van Caneghem. Command And Conquer 2: Generals is made for PC only release, to be released by Eletronic Arts and is developed by rebranded Bioware Victory Studio -- which is subsidiary for Eletronic Arts. Bioware Victory was previously known as "Victory Games" before the rebranding. Several members of the core development team for the game have previously worked with other C&C franchise titles, thus having previous experience with the franchise. Command & Conquer: Generals 2 will be built on "Frostbite 2" engine. When asking about why the Generals spin-off of the series is getting attention now, after long time of being off the spotlight, Jon Van Caneghem states, that the original game was actually best-selling title in the series. He says that community has been asking for sequel and thus they want to respond into the demand. Caneghem also thinks that return to Generals was long overdue: "We were really attracted to the near future time perioid and the themes we could explore and the project went from there". So how will the new title differ from original Generals title, and does it still have RTS mechanics of base building and army management? Caneghem reveals that one of their main goals is to bring C&C back to the roots that "have made it one of the most popular and beloved properties in the strategy genre and that revolves around the core gameplay." Thus player is "a General" and it's up to them to create and control massive armies in game. 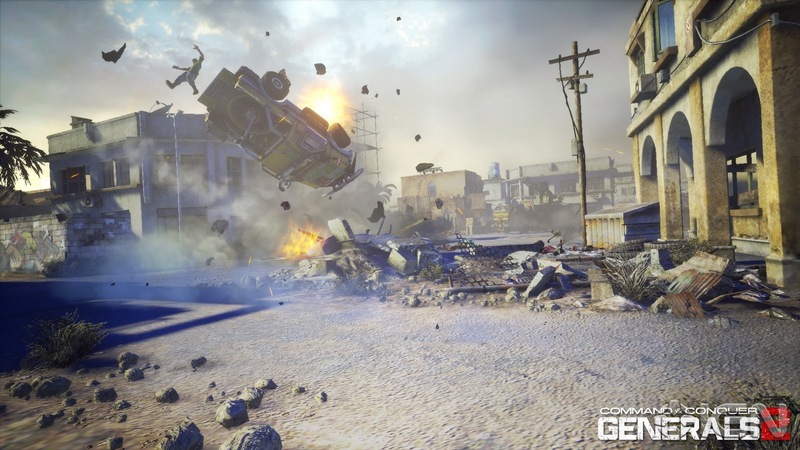 He states that action-packed gameplay that also requires player to be cerebral is the key in the new title, but promises also some new elements to be presented. Story setup will take place ten years after the events in Generals. At the very beginning world is at peace, and all major parties are about to hold a huge conference where a landmark peace treaty would be signed -- when suddenly wipes away all the leaders in attendance. The only leaders left are "generals", which is where the player steps in the storyline. There will be three factions in the game, but Caneghem only reveals two of them: "the GLA and EU and one more we aren't revealing - yet!" Ray Muzyka tells a bit about how the new title ties with the BioWare brand and image, will there be any affection at all that it's using the brand known from role-playing games? Myzuka tells that vision of BioWare is to create "the most emotionally engaging games in the World -- this works across multiple genres." BioWare will aim for this vision, no matter what the genre or platform was. He also promises that BioWare will apply the vision in new C&C title in a way that makes sense for the genre and C&C series, and it will not necessarily be in the same way than they've done it in the past. When asking Jon Van Caneghem about the company (BioWare Victory), he reveals that the studio was founded earlier this year and thus became part of BioWare label this summer. The core team is based in Los Angeles, although the team is located in multiple studios. Several of the team members have worked previously in C&C games, action games, shooters and RPG's thus covering members of several genres as well as from the C&C franchise. The engine that Generals 2 will use is Frostbite 2, an game engine that was developed by EA Digital Illusions CE, creators of the Battlefield series. Version 1.0 debuted with Battlefield: Bad Company in 2008, while the newest version also to be used in the new C&C title debuted with Battlefield 3 earlier this year. Thus it will take full advantage of DirectX 11 and 64-bit processors. This also states that it won't support DirectX 9 nor Windows XP -- nor should the game either. Caneghem states that "Frostbite 2 is an incredibly powerful piece of technology. Not only are we going to be able to raise the bar in terms of the level of fidelity for the genre, it's also going to allow us to make the whole experience more intense. Players are going to command massive armies on a battleground that is fully destructible." Muzyka also shares his thoughts about Frostbite 2: "the technology also allows us to create high quality, in-engine cinematics that flow seamlessly with the gameplay, to help increase the immersion and emotional engagement for the player as they experience the story." According to Caneghem, multiplayer will be a vital part in Generals 2. He tells that BioWare are focusing hundred percent to both single- and multiplayer modes. Single-player campaign will allow player to take sides of several different factions and experience the new war from multiple perspectives. He also claims that BioWare team has "some great plans for multiplayer", but aren't going to share any more info just yet. Caneghem shares a small glimpse about multiplayer though: "I'll just say there's going to be a lot more variety than you typically see". Whatever this means, we will find out later on. "I think the best games have been the ones that have been accessible, which helped bring in a much larger audience, but also challenging to master, which helped create a lot of retention, passion and core community-building around different franchises. Over the years we've seen different attempts to move the genre in different directions and I think that may have caused things to drift from that core gameplay philosophy of driving gameplay that's fun and fast paced, yet always strategic. That's ultimately the foundation we're working off of for Generals 2, while also innovating in new areas and adding some of the things BioWare is known for with interactive storytelling (delivered in an appropriate way for the genre, which is critical) and always driving for high quality." Ultimately Muzyka seems to think that he and the team are aiming for driving, fast gameplay, that is not too hard to get into, yet has strategic control which is needed to learn to play the game most efficiently. He also puts emphasis on interactive storytelling (as also mentioned earlier in the interview) and innovation for new ideas. The last words? Muzyka: "We know there are a lot of Command & Conquer fans out there and we're looking forward to bringing them back to the Generals universe."